Google announced on Tuesday that users of its social network, Google+, are now able to sign in to third party apps using their Google+ credentials. Similar functionality has existed in rival social network Facebook for years, and Google+ finds itself once again playing catch-up, fledgling venture that it is. Google's touting a number of improvements over Facebook's app sign-in functionality, without specifically calling its rival out by name. But when Google's director of product management for Google+, Seth Sternberg, promised not to let apps "spray updates" all over the place in a Tuesday Google Blog post, we all knew who he was referring to. Sternberg promised that Google is focused on "four key principles" for the initial release of Google+ application Sign-In. Those principles are "simplicity and security" (which sound like two principles to us), desktop and mobile being "better together," sharing content vs. "spraying" it, and "sharing is for doing, not just viewing." The first is self-explanatory: With Google's various services becoming increasingly more connected all the time, a log-in for Gmail, Youtube or any other Google service can be used as well as Google+ credentials. And users can easily review the apps they've signed in to at plus.google.com/apps. "Google+ Sign-In also comes with the protections and safeguards you've come to expect from your Google account," Sternberg wrote. App Sign-In comes with some other features that benefit from Google's ubiquity across devices and service, like the ability to connect mobile and desktop devices in new ways. For example, when users sign in with Google+ credentials to a desktop app that has a mobile equivalent, they'll be able to install the app on their mobile devices with a click. Google also teased new "interactive" Google+ stream posts that will invite users' friends directly into third-party apps. That sounds a lot like those annoying Facebook notifications that ask users to allow third-party apps to access their profiles, but at least the Google+ equivalent will stay in the stream and out of your inbox (hopefully). 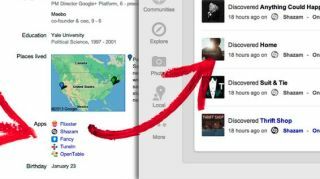 Most importantly, perhaps, Google promised that with help from Circles, it will be easy to determine which apps will share what information with whom on your Google+ profile. "Google+ doesn't let apps spray 'frictionless' updates all over the stream, so app activity will only appear when it's relevant (like when you're actually looking for it)," Sternberg wrote. Judging by the number of inane and pointless third party items that appear in our Facebook news feeds, we'd hazard that it's easier said than done. That or maybe our friends just really don't understand what's appropriate to share. Several apps will soon roll out or have already integrated Google+ Sign-In, including Flixster, OpenTable, The Guardian, Shazam, and USA Today. Developers who want to integrate the Sign-In feature should head to Google's developer docs.